A sunny Autumn morning welcomed the U13s first ever league fixture. Hertford arrived with a vociferous support and a match squad of 16 players. Harlequins planned to utilise a squad of 22, politely supported by London’s most decorous parents. The discipline and organisation of the tight Hertford XIII was evident from the kick-off and the visitors quickly took the lead. The Hertford scrum was well-drilled and their backs were all aware of their roles, maintaining defensive and offensive position as the game ebbed and flowed. Quins by comparison were often having to scramble defence and found themselves outnumbered at the breakdown. Fortunately, the hosts possessed a “secret weapon in plain sight” and two solid defensive displays by wingers Josh and George. The weapon, of course, is Frankie. 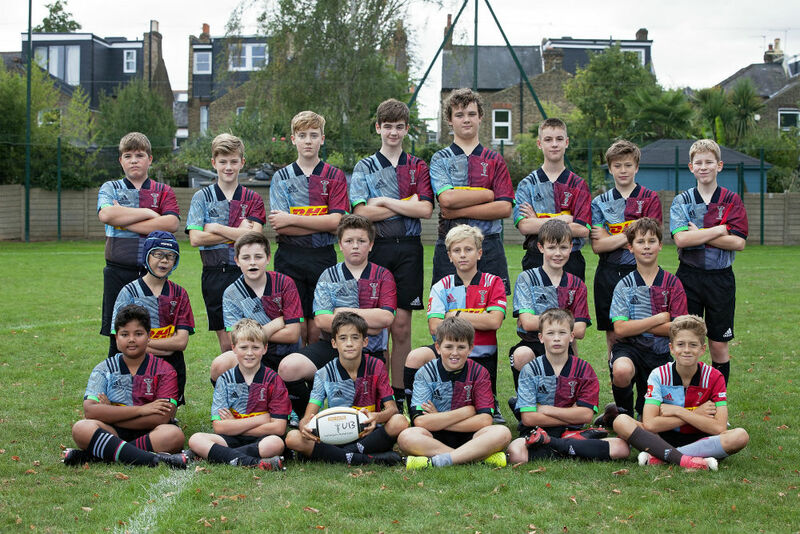 He is bigger than half the coaching staff and is clearly an intimidating sight for twelve-year old opposition: thus, two straight, uncompromising charges were enough to drag Quins level and then take them into a score advantage. The latter came from Frankie collecting the ball in his own half and simply running a straight line that had defenders bouncing off him, when they could get beyond his right hand-off. Up to that point, the majority of the possession had Quins in their own half, with defenders rushing left or right to cover the overload. With Quins taking the lead, the bench was unloaded and the home team began to assert some control. Some crucial tackles by Cash and Oli, powerful running from George and Josh, and some excellent work in the engine room from Ben and Thomas halted the Herts attack and established some territory in the attacking half. A powerful run by Josh down the left found support and, as the visitors’ defence flirted with the offside line, scrum-half Gabriel picked up and darted through to establish a two-score lead. It was a lead that could and should have been extended: Hertford were beginning to struggle to contain the straight running of Ben and Fred and the squandering of two resulting big overlaps was to prove costly. Nevertheless, half-time arrived with Quins in front and brimming with confidence. For the second time, Quins made a raft of changes, but this time the effect was less than positive. Quins returned the kick-off well but they struggled to establish field position and the defence was always outnumbered. Although some Quins defenders worked hard to cover the huge holes in midfield, too often they failed to make a tackle. As Hertford continually probed from left to right, Quins found it difficult to contain the attacks, and even harder to retain possession. It wasn’t helping that the forwards were far too upright when going into contact and were attempting to rip the ball upwards when mauling. Hertford grabbed two tries from close range when the ball popped out of Quins arms as players attempted high offloads instead of taking the ball to ground. Quins did make some forays upfield, Wilf going on one mazy run on the right and Gabriel breaking away in to wide open space on the left. But on each occasion there was the unusual sight of two of our most exciting runners being caught from behind! With Hertford exploiting Quins propensity to have either Mack or Thomas defending the outside channels, and three strikes against the head on the Quins put-in, a fourth and ultimately winning score came their way. Quins continued to battle, but it was from deep positions. There was the somewhat unedifying sight of Aran putting in a clearance kick from under his own posts, and the wasting of a four to two overlap as the ball carrier turned back inside with Wilf in acres of space on the outside. It was an excellent game for the watching parents, the boys enjoyed it and there were many good skills on show, not least Barney’s much-improved handling and Ben Hallett doing some excellent defensive work around the fringes when his team was under pressure in the second half. The areas that will need work before the next outing include communication, ball retention and alignment in both attack and defence.